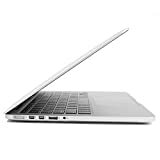 The MacBook Pro "Core i5" 2.7 13-Inch (Early 2015 Retina Display) features a 14 nm "Broadwell" 2.7 GHz Intel "Core i5" processor (5257U), with dual independent processor "cores" on a single silicon chip, a 3 MB shared level 3 cache, 16 GB of onboard 1866 MHz LPDDR3 SDRAM, 512 GB Solid State Drive, Lane PCIe-based flash storage by default, and an integrated Intel Iris Graphics 6100 graphics processor that shares memory with the system. It also has an integrated 720p FaceTime HD webcam, and a high-resolution LED-backlit 13.3" widescreen 2560x1600 (227 ppi) "Retina" display in a case that weighs just less than 3.5 pounds (1.58 kg). It does not have an internal optical drive. Connectivity includes 802.11ac Wi-Fi, Bluetooth 4.0, two USB 3.0 ports, two "Thunderbolt 2" ports, an HDMI port, an audio in/out port, and an SDXC card slot. In addition, this model has a backlit keyboard, a clever haptic-capable "Force Touch" trackpad and an internal, sealed battery that provides an Apple estimated 10 to 12 hours of battery life depending on use. 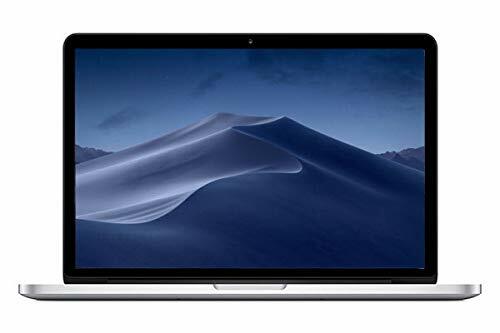 Compared to its predecessor, this model looks nearly identical externally, but it has a more advanced processor and architecture, more advanced graphics processor, faster RAM, a faster SSD, and a higher capacity battery as well as the aforementioned more advanced "Force Touch" trackpad.